Well, where do you start with this guy? Alan was bought up with motor-cycles, influenced by his Dad Archie who was a keen sidecar scrambler Alan was riding in scramble meetings when he was 12 years old! 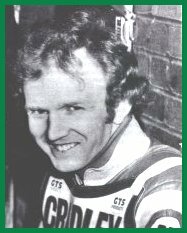 His speedway career started at Birmingham in 1972 riding in second - half events that year. On 24th April 1973 he made his debut for the Brummies against Crewe, scoring paid 7 points but only made 7 appearances for the team that year. Progressed in 1974 and in 1975 Alan finished his apprenticeship at engineering company Bellis & Morcom and became a full time Brummie, he was a sensation scoring 9 maximums before breaking his femur to put him out for the rest of the year. He spent the next two years with Birmingham but then after a fall out with the management joined the Heathens in 1978. Scored 8 points on his debut against the Wolves then satisfyingly went to Perry Barr on the Monday to score a 12 point max. He went on to become an England International and made his British Final debut in 1978 too. Nick named 'ever trying' by the Cradley faithful and then Big-Al by Bruce Penhall in 1979 - he was second only to Bruce in the Heathens averages. In 1980 he formed a fearsome partnership with Phil Collins and wintered in Australia, finishing the second highest scorer for the Lions. 1981 saw Alan helping the Heathens to league championship. 1982 saw the British Final going to Andy with Alan finishing runner up to his brother. Once again he helped Cradley to the league championship in 1983 as part of probably the best speedway team ever. He made his first and only appearance in a World Final in 1984 at reserve but managed two rides when Vaclav Verner was injured and dropped just one point! Alan had a disappointing season in 1985 by his high standards even having time off with a broken collar-bone. Colin Pratt announced that he couldn't fit him into the side in 1986 and Big Al was loaned out to Swindon, he started well even winning the British semi-final in May then he crashed at Wolves and spent 11 weeks out with a broken ankle. When he returned however he struggled, and a visit to the hospital revealed that Alan had Hodgkins Disease typically though he rode on for the remainder of the season. 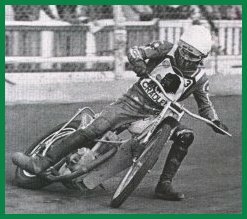 He was offered new terms from Cradley in 1987 and although he declared himself fit he first took a tumble at Kings Lynn and missed six matches before returning to face Belle Vue for just 2 points, he was a mere shadow of his former self and was forced to have a course of radiotherapy, it looked as if his career was over but Big Al bounced back with 10 points against Sheffield and 8 against Wolves, then came his best ever performance so far against Bradford with 16 paid 18. He also scored a maximum in his own Testimonial Meeting, however it was short lived and Alan's scored were up and down for the rest of the year. He declared himself fit for 1988 but crashed and broke his collar-bone he was out for a month, when he came back he found himself at reserve, it was a great opportunity to get his confidence back and later in the season started to rattle up the points with partner Simon Cross. The highlight of the season though and even the highlight of Alan's career was against Coventry in the KO Cup Final - Coventry were favourites but Big Al had other ideas and scored paid 15 at Brandon to give the Heathens a 10 point lead from the first leg. He scored 10 in the second leg the next night to become the toast of Dudley Wood. 1989 he went through to the Intercontinental Final and finished 4th in the prestigious Golden Hammer but then went off form towards the end of the season. 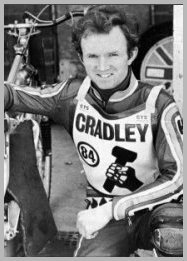 The following year Alan and Cradley had a quiet year but he still upped his average to more than 6 and a half. He made a good start to the 1991 season and was runner-up in the British semi-final but failed in the British Final itself. At 37 years old he was one of the oldest in the best league in the world. With newcomers Greg Hancock and Billy Hamill now the future of Cradley, Alan moved on to Loomer Road, Stoke to try his hand in the lower division in 1992 he immediately became a star with an 8.6 average and two maximums. Surprisingly in 1993 he found himself back at The Wood with brother Andy but he crashed at Cradley against Reading in May receiving facial injuries and while he was out Colin Pratt bought back Billy Hamill and Alan moved on to Oxford. He stayed there in 1994 but ended the season with Peterborough after being dropped. He joined Hull in the one big league of 1995 and stayed with them until the end of the 1998 season, then he retired at 44 years old and 26 years of racing. Or did he? Well at Peter Fosters book launch Big Al was there, with his hand bandaged from a recent crash. Well you just can't keep this bloke down, he's back where he started with the sidecar scrambles! Big Al is now machine examiner at Monmore Green and regularly vists Dudley Heathens social events. Once a Heathen always a Heathen! Thanks to Peter Foster for his help with research.